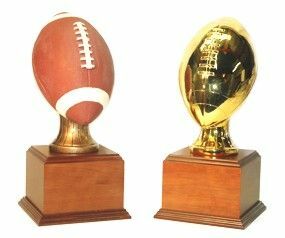 This large resin regulation size football comes in 2 finishes: Full Color, and Shiny Metallic Gold . 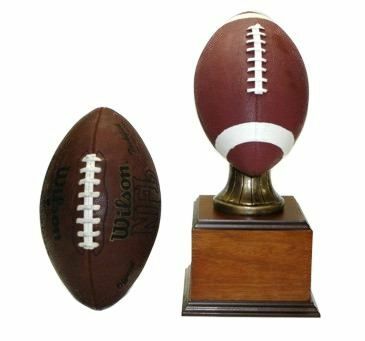 The ball sits on top of a wood base, and stands an impressive 16" tall. The full color football is textured just like a real one, and the metallic gold has a smooth / mirror finish. It comes with a customized plate on the front with your League Name and any other information you want.This trophy can have a side plate for a "Hall Of Champions" listing all of your leagues previous winners. The extra side plate cost $10. We will hold your information on file so you can reorder an updated plate each year for the same $10.